! This is NOT a method of direct communication with THE PAISLEY POSEY - FLORAL & GIFT SHOP for purposes of ordering or rectifying problems. THANK YOU! We're in eastern PA Our gift was for our 7-yo grandson, in Wrigley, who had just survived his first stitches -- 7 of them! Without a word, except a little email, the gift was put together and delivered as requested, and, in quick order! From what I was told, the basket went right into the arms of a parent. Bravo! There are too many doors at my son's place. The PAISLEY POSEY delivery person was right on top of that, tho. I sincerely appreciate the prompt and conscientious service, (our grandson, however loved the candy best! excellent service and the wife loved her flowers. Thank you for getting my mother's day flowers ordered for my step mom and mothernlaw delivered in time in such short notice! They were beautiful! 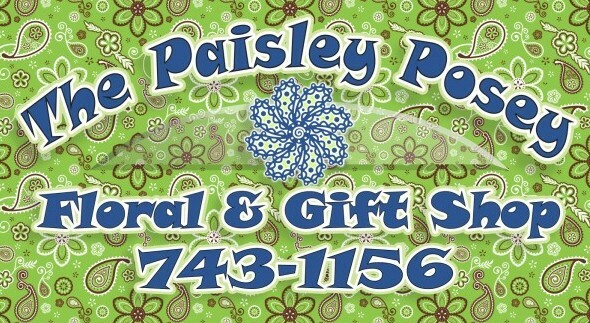 Thank you to The Paisley Posey for delivering our arrangement on a Sunday. It was beautiful. Such unique work and always beautiful!! The Paisley Posey forever has our business! They did a beautiful arrangement for delivery and it was perfection! OMGoodness!!! I was so pleased to see the arrangement you made for me. The website did not do it justice. Absolutely gorgeous!!!. Very talented people you have designing these arrangements. Will always order from you as I have in the past as well. Thank you, and Merry Christmas. The Paisley Posey does an amazing job! They are professional, courteous and their arrangements are beautiful. This was a very positive experience. When availability issues came up, things were easily worked out. Having an emailed picture of the flowers which were sent to my cousin's funeral let me know we'd sent a nice arrangement. I also got to share the photo with my 95 year old father. He thought the flowers were very nice too.